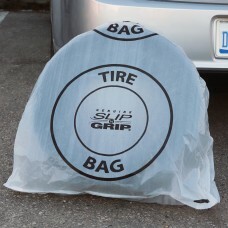 Our Tire Storage Bags are constructed from durable white film and feature a tire printed on the outside along with the iconic Slip-N-Grip logo. The white film film hides the dirty tires at auto dealer service departments, car repair shops, and auto body shops. Covering tires with these bags sends a clear message to customers that their satisfaction and the cleanliness of their vehicle is an important priority to your company. These bags are totally impenetrable by chemicals, grease, and grime. We offer two different size/thicknesses of tire bags, both of which are made by Slip-N-Grip, with their renowned three layer construction for superior strength and durability. These are ideal for transportation and storing of off-season tires.